This is the first of three in a series on Cocktail Science. Read part two, On Shaken Cocktails. Natural selection, at base, is the differential survival and reproduction of living things on the basis of observable traits. A cheetah is more likely to survive the wild, capture more prey and ultimately produce offspring if she has a new set of traits, ones which even her own parents lacked, that make her observably faster or more cunning than the average cheetah, for example. Her offspring have a greater chance of doing the same since they are more likely to have their mother’s advantageous traits. For this to occur, however, information needs to be conveyed from one generation of cheetah to the next, to preserve what came before. Through random and undirected changes in such information from one generation to the next, “innovation” (in a sense) has occurred. This basic idea serves as the bedrock for our entire understanding of biology. It’s a powerful idea to say the least, but it famously applies to a great number of things beyond living ones. Take cocktails as an example. The development of cocktails breaks down to ideas being transmitted as information through cocktailers of all stripes and skill levels. Each cocktail made is, in a sense, a new generation born anew, to live and die in a single glass. The heart of all of this is what governs information in the “wild” so to speak, be it in the biological world or the cocktail world. Famed evolutionary biologist, Richard Dawkins, originated this way of thinking and called the transmitted information memes (as opposed to the biological genes). By such a view, a cocktail meme reproduces, mutates and is subject to selective pressures, as is this case of a biological gene. Given the now decades-long sustained interest in cocktail culture in the West (and nearly a century in Japan), we’re currently experiencing the cocktail equivalent of the Cambrian Explosion. Every bartender is coming up with new and, and so they hope, interesting cocktails in the wild. There is a lot of competition out there in cocktails. We might observe that this gives us a unique opportunity to explore the rich cocktail memetic landscape, understanding what kinds of cocktails are proliferating and if they have some commonalities. Since cocktails live and die by the taste perception of humans, such commonalities would theoretically reflect broad human taste preferences. In other words, by sorting though the observable traits of cocktails, we might shed light on the whole of the experience. First of all, it’s important to define the set of cocktails we wish to study and which traits within that group we wish to observe. Choosing the set of cocktails will be tricky because we don’t want to observe an evolutionary dead end. We want to understand the fast and cunning cheetah, not the lazy, stupid one. As a result, it makes sense to look to the most current but well accepted iteration of classic and modern classic cocktails. For this group, I’ve used the recipes from famed bartender Dave Arnold’s influential and award winning book, Liquid Intelligence, which is generally regarded as an unimpeachable and definitive volume on cocktailing. So that we compare cheetah traits to other cheetah traits, I think it makes sense to limit ourselves to a particular cocktailing genre among classics. 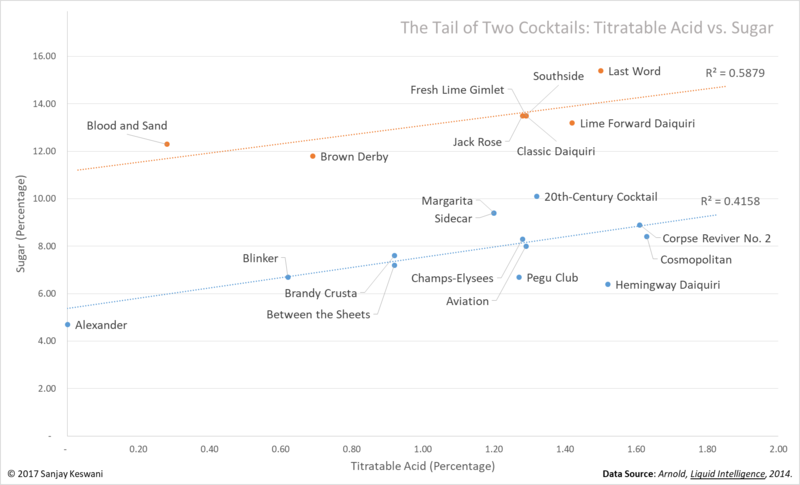 By my view, the most obvious, objective and easily measured characteristics of cocktails are the basic taste characteristics, namely content of alcohol, acid and sugar. The genre of cocktail with the most variation among these taste characteristics are shaken cocktails, as it turns out. That is (as opposed to stirred, glass built or blended cocktails), those cocktails which generally are built in a shaker, combined with ice, shaken and strained into a glass. If we take all the shaken cocktails presented by Arnold in his book, they include a total of 21 classic and modern classic cocktails, including: Alexander, Blood and Sand, Blinker, Brown Derby, Between the Sheets, Sidecar, Margarita, Jack Rose, Gimlet, Southside, Champs-Elysees, Aviation, Classic Daiquiri, Lime Forward Daiquiri, 20th Century, Hemingway Daiquiri, Corpse Reviver No. 2 and Cosmopolitan. As part of his exercise of measuring the characteristics of the cocktails presented in his book, Arnold produces values for the concentration of alcohol, acid and sugar. I’ve independently verified his measurement work for all included cocktails. The story told by this chart is of one cocktail relationship as represented by two lines. That is to say, there are two subsets under the umbrella of classic shaken cocktails, one that’s overall sweeter and one that’s overall dryer. But both subsets of cocktails obey the same relationship: As acidity increases, so too does sugar. And it does in a very linear, predictable pattern. You might charge that I’m just reading tea leaves or stating the obvious, except that such a strong relationship exists between the cocktails and regression lines, yielding real and actionable information. Theoretically, then, the two lines form a safe Classics Corridor, within which anyone could develop a cocktail and, so long as the flavors pair well, it would taste delicious and beautifully balanced. 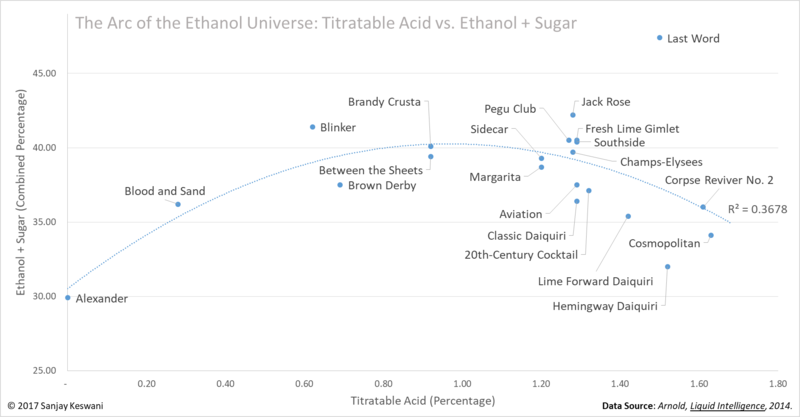 With the exception of the oddball sweet and booze-heavy Last Word, all the cocktails fell surprisingly well on an inverted U-Curve such that, as acid content increases, alcohol plus sugar first rises and then decreases. To me, this suggests that at some critical mass of acid (around a one percent concentration), alcohol and sugar taken together tend to have an increasing balancing effect on acid. There are other explanations, of course, but this seems the most plausible given the implicit assumptions we’ve made for this analysis (that is, that what we find is informed by general human taste preferences). So based on all of this analysis, I may have fundamentally separated a large portion of cocktail art from science. It appears that so long as you fit a cocktail into the Classics Corridor and on the Inverted U-Curve, you could make new and delicious cocktails all day. Your only limitation would be how well flavors pair together. Cocktail development would be made far easier, only having to punch the right proportions on ingredients into a model to beautifully balance a cocktail. No more hunches, guess and check or strictly adhereing to classic cocktail proportions. If true, you could almost just throw amazing cocktails together with whatever you had lying around the house, so long as you knew their alcohol, sugar and acid content and the flavors worked. A next step might be to test my theory. But first, of course, you all need to learn how to make cocktails. So, in the second part of this series, I’ve addressed the science and the art of shaken cocktails in a deep but concise manner including a dive into ingredients, technique and equipment. The final article, to be published next week, will test my cocktail development model. Spoiler: I wouldn’t be publishing this if I wasn’t sure the model worked! So stay tuned! How are you getting the data points for acid, sugar/ethanol content? US department of agriculture publishes data on average sugar and acid content of citrus fruit grown in the US. Dave Arnold made educated estimates of sugar content of liquors in Liquid Intelligence based on refractometer readings and subjective judgement. Syrups you mix yourself and therefore know exactly what’s in there. Ethanol content is always available by law on bottles. To verify Arnold’s work, I titrated citrus and took my own refractometer readings of liquors though.